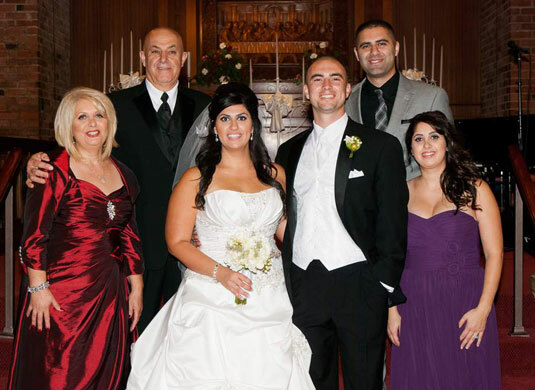 Wedding party and family portraits give you the chance to let your photographic artistry shine. You want to make sure you get good portraits for the bride and groom to remember their special day. Portraits of the wedding party can be a lot of fun! This period is the time that the couple are with all their closest friends, so feed off of the energy of the group to capture the spirit of excitement and joy. For example, if you have a groom and groomsmen who are having a blast and joking around, try asking them to do a running or jumping picture. Or if the wedding party does something spontaneous, like cheering when the couple kisses, make sure you capture those moments. Of all the formal portraits, the family pictures feel the most like herding cats. About a month prior to the wedding, you should ask the couple for a list of family members and specific portrait groupings; now is the time to hang on to that list like it’s your lifeline. You can use the 24mm or 24–70mm lens for the family pictures, and you should use a minimum aperture of f/5.6 and go up to f/11 based on the number of people and rows in a group. For example, if you’re shooting just the bride and groom with the bride’s parents, f/5.6 will suffice. However, if you’re shooting the bride’s extended family and have three rows of people, you want to shoot at a minimum of f/8. Looking for lighting: Like all portraits, you want to find a soft light that falls evenly on all members of the group. If possible, shoot outdoors; that setting provides the best lighting. However, you may be asked to shoot indoors, in which case you may need to use a tripod, a flash, or perhaps both. If you do need a flash, make sure you use a diffuser so your subjects’ faces are evenly lit and the flash illuminates everyone in the photo. Choosing a background: Because the large group photos have so many subjects, choose a simple background. A background that’s too noisy distracts from the subjects and makes the photo look cluttered. Using levels to your advantage: Look for stairs or other elements that allow you to layer people in the large group photos. Putting people on different levels helps you avoid having all the subjects standing in one long line and condenses people so you can easily fit them in the frame. During the family photos, everyone who owns a camera seems to decide he wants a picture as well. This situation can create a big problem for two reasons. First, people get in the way of your photo; second, the subjects don’t know where to look! The last thing you want is to review your family photos at home only to find that everyone is looking in a different direction. If you find yourself in this situation, be kind but firm. Ask those who are taking pictures to please wait until you’re finished. You may need to ask more than once, but don’t be afraid to let people know that your pictures are the priority. The family portraits can be tense and frustrating, but don’t let that show on your face. Ever. Even if you feel like pulling out your hair, take a deep breath and keep calm. The wedding day isn’t about you; it’s about the couple and their families.